Colossus of Ramesses II The Colossus of Ramesses is an enormous statue carved in limestone. 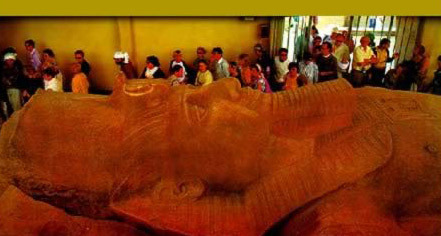 It is about 10m (33.8 ft) long, even though it has no feet, and is located near the village of Mit Rahina. A small museum has been built to house this magnificent piece. The fallen colossus was found near the south gate of the temple of Ptah, located about 30m from the huge limestone statue of Ramesses. Some of the original colors are still partly preserved. This piece was found in 1820 by an Italian traveler Giovanni Caviglia. Mohammad Ali donated the statue to the British Museum, but the task of moving the piece prevented the British from taking it to England. It is located in the archaeological zone of Memphis in the museum built to protect it. "Anyone who has never carved stone might marvel most the quarrying of the many-ton block, and then at the task of roughly hewing it into shape, tasks which must have been gargantuan. Of course, this impressed me, but the drudgery of rough carving spoke to me of an effort that could have been achieved by any gang of workers sufficiently numerous, supervised, and driven. Persistence on this grand scale is not uncommon. The distinction of the Ramesses colossus lay elsewhere. The essence of this great statue lies in the many square yards of carved surface. Faced with a task of such magnitude, a cold sweat would form on the brow of any modern worker in stone. I scrutinized a ten-foot-long portion of the royal leg. Along its entire length no flaw distracted from the grace and power of the sinewy, kingly stride, and I knew something of the difficulty with which such perfect surfaces could only be achieved. Among the many problems presented by this stone, it likes to chip unpredictably to the terror of the sculptor who would shape it. The stone was familiar to me. I had worked on a small piece of similar but softer material the year before, and the twenty years' experience that went into my small sculpture provided an insight into the true greatness of the colossus before me. I had spent countless hours vainly trying to grind out by machine the countless ripples that had formed in the carving process - on a much smaller expanse of softer stone. Only after much experimentation with various abrasives and finally with different rhythms of sanding was I able to produce the smooth surfaces essential to the overall impact of the work. Even on the small scale the effort involved was enormous. When modern, mechanized marble yards cut, smooth and polish stone the size of the Ramesses, the shapes are either flat or they are featureless columns. It is done with power tools the size of houses and even then the work is painstaking, time-consuming and risky. Here, the ancients achieved perfection with hand-held stones and crushed abrasives applied to sticks. And the shapes wrought were the complex, subtle forms of the human anatomy. How these master carvers achieved perfect surfaces on this scale with simple tools was beyond my comprehension. My own twenty years' experience provided no clue. But clearly this was not the work of slaves. This forty-foot length of stone could only have been brought to life through the sensitive hand and watchful eye of a master sculptor, and with a great deal of loving care. Unlike so many works on a herculean scale, this Ramesses allowed for no imprecision in areas the sculptors knew could not be seen. The hidden places were equally finely finished. There were no technical concessions to the many near-insuperable problems that had to be faced. Looking at the supreme craftsmanship that went into the body's hidden recesses as well as its conspicuous visible areas, it was clear to me that all involved in making this image had the integrity and wisdom worthy of the god the great king was meant to represent."